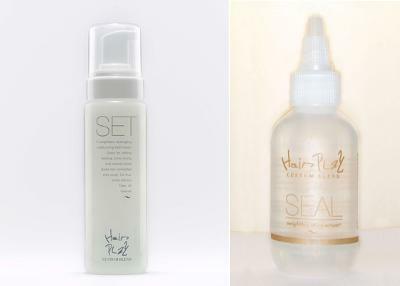 SET and SEAL are two new eco friendly styling products for any hair types, texture and length that can be used for twisting, setting, blow-drying and natural styles and give hair controlled silky body. With SP15 UV protectant and light scent of ocean breeze, SET setting lotion contains properties of a deep conditioner, mouse and gel "all in one" simplifying daily beauty routines and alleviating product clutter. offers flexibility for both straight and curly styles by detangling and de-frizzing while adding volume and dimension. polished, glossy shine without weighing the hair down. Light Hold adds major body to fine or limp hair. Medium Hold detangles and moisturizes thick, dense and or curly hair. Extra Hold is for the coarse or most untamable hair. The finishing product SEAL is a weightless shine serum that increases moisture, eliminate frizz, and maximizes shine-without putting your locks on lockdown. Did you try this product? - We love to hear your feedback!